National BMX Hall of Fame just announced this year's nominees in six categories with Howie in the "Industry" category. Howie's the first BMX-related person I spoke with before there was Generation BMX or The BMX Boys of E.T., back in 2013. I wish I had saved the voice mail he'd left after the multimedia piece published because no written word can capture the joy in someone's voice. He also let me know that he spotted a typo. Howie passed away a few months later. I wrote an "In Memoriam" post on my personal blog; I've pasted the whole entry below. I'm glad his Everything Bicycles website is still up. I used to spend long hours looking through the galleries. And I'm happy to see his name on the nomination. Hope a plaque with his name and picture graces the walls alongside other Hall of Famers. Below is the full entry from 2013. Also find this post with all audio interviews with Howie. The clips are also on YouTube. Scanned copy of Howie's 1982 Christmas card. July 13, 2013, 12:56 p.m.
"I was just wondering if you knew that Howie Cohen has passed"
The text message from Robert Cardoza floored me. I'd been thinking about Howie this past week. Our last conversation over the phone, a little over a month ago, was regarding the possibility of pursuing a BMX documentary, his website, and my interview with Bob Osborn. I had asked him when he'd visit New York, to which he replied, "I don't like traveling much but you're welcome to visit me any time." I didn't know who Howie Cohen was until a few months ago. We became acquainted when my girlfriend introduced me to him. He was an expert on the history of bicycles and she was interviewing him for an article. Howie shared with her that he had built the bicycle for the movie E.T. and I was off and running to find out more details. It made Howie happy that I'd wanted to tell his story. We emailed back and forth often and talked over the phone. He asked if I wouldn't mind calling him at 7 am (MDT). Most of our conversations, including the interview that ended up in the story, were conducted during those morning hours. 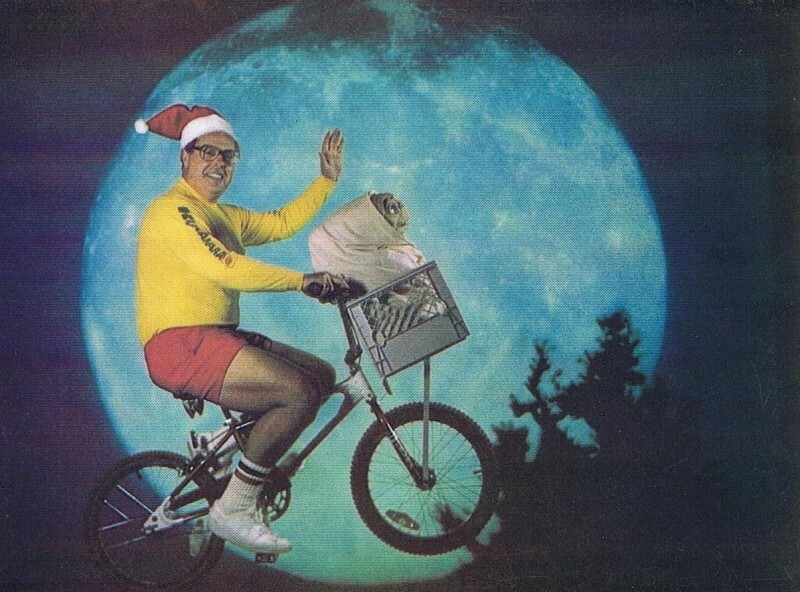 He meticulously catalogued his collection of bicycle images and memorabilia and so every image, art board, and E.T.-related items were emailed to me with exact captioning, labels etc. Howie is the reason the story evolved to also include the untold story of the stunt bikers from E.T. He personally connected me with Robert Cardoza and suggested I also connect with Bob Haro and Bob Osborn. I feel honored that Howie shared his stories with me. Bicycle stories made him happy. It made him happy that this newbie filmmaker wanted to make a BMX documentary. It didn't matter to him I couldn't tell the difference between a gyro and a BLT. It mattered the subject was bicycles. 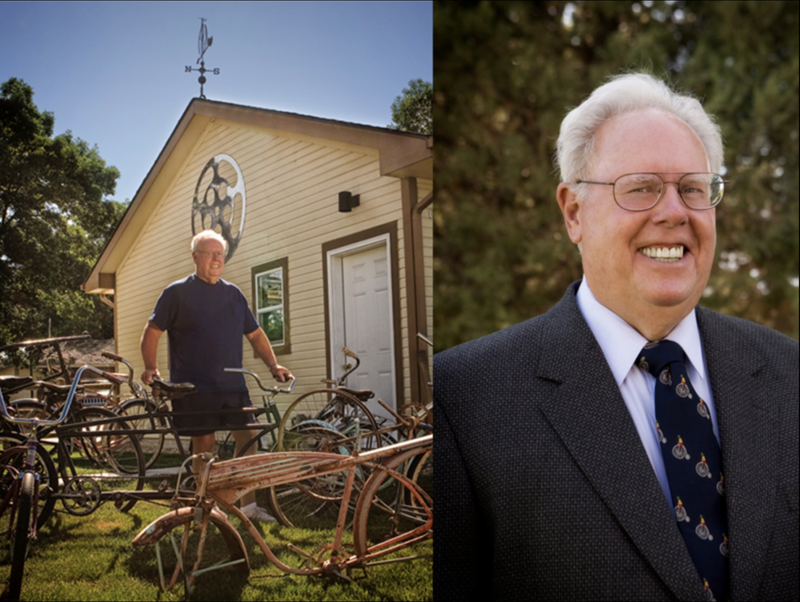 Everything Bicycles was not just the name of Howie Cohen's distributor, it was his life. The BMX world owes a great deal to this man. I'm not alone with that thought. Below is a series of recorded interviews and photos Howie provided for the original piece but didn't end up in the final article. "Growing up in the Cohen household was wonderful; I have so many warm memories about my youth. Bicycles were always a part of our family life; both at home and also in the bike shop that our parents owned. 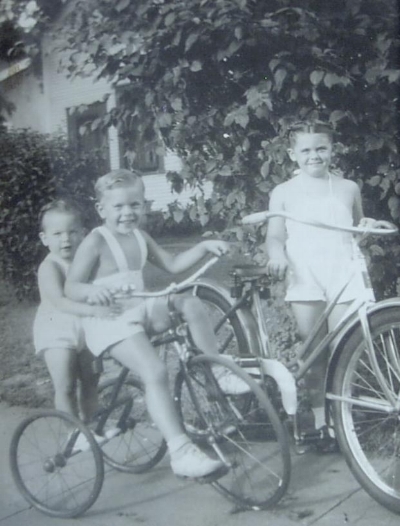 My sister, brother & I always had several trikes and/or bikes to ride at our disposal. My parents always encouraged us to participate in bicycle events and neighborhood bicycling. We went on occasional bicycle outings. My first vehicle was a tricycle; here is a picture of me at about 18-months of age on it. My first two wheel bike was a 12 inch sidewalk bike at about 3 1/2 years of age. I've always had bicycles in my life and recently (this year) acquired a new bike from a Detroit bicycle factory (Detroit Bikes) that I am riding almost everyday (weather permitting). It's such a pleasure!" "This pic was taken in Minneapolis, MN in the early-mid 1940s. My sister, Louise Cohen, is standing adjacent to her 24x2.125 wheel bike, I am sitting on the large tricycle, and my younger brother, Leo Cohen Jr. is standing on the rear axle of the tricycle. Both of my siblings were involved in the bicycle business and unfortunately both have passed away." "My wife Kay & me posing next to the large fish (325-lb) I caught off of the Kona coast of HI. I was using 30-lb test line with relatively light tackle (rod & reel). I was a light tackle deep sea fisherman for most of my younger years. June 1990." "Going through my picture photos for you is a real treat. I haven't these pics for quite a while and it is nice to reminisce ("natsukashi" is the word in Japanese-I have a rather large Japanese vocabulary). This pic was taken in the front garden of the home of Mr. & Mrs. Shozo Shimano. Shozo was the president of Shimano at the time. I and my two associates had just enjoyed a lovely luncheon in their home. Shimano is the largest manufacturer of bicycle components in the world. The three Shimano brothers Shozo, Keizo & Yoshizo) grew their company from humble beginnings due to their diligent work and intellignet business decisions. Shimano products are second to none in quality and market acceptability. (Back row, L-R) Shozo Shimano-president of Shimano Japan, Zeldon Lipski-president of Lousiville Cycle & supply of Louisville, KY, Keizo Shimano-vice president of Shimano Japan & the capable engineer, me, Paul Hinkston-manager of our product development department, Yoshizo ("Yoshi") Shimano-president of Shimano USA. Front row, L-R) Mrs. Shozo Shimano & Mrs. Keizo Shimano. Shozo & Keizo have already passed away. Yoshi is still alive and well and is semi-active in the company. Shozo's son, Yozo, is the current president of Shimano Inc., Japan." "These two pics [above] were taken at our home in 2009. The pic with a few of the old bikes in my collection is taken in front of the side of our garage in our back yard. Notice the huge 372 tooth sprocket (chainring) mounted on the side of the garage (custom made for me & engraved by Sugino Cycle Industries) and the high wheel bicycle weather vane on top of the roof of the garage. The pic of me in a sport coat & bicycle motif tie is unusual because I very seldom wear a tie these days although I have over 300 ties with bicycle designs in my collection. 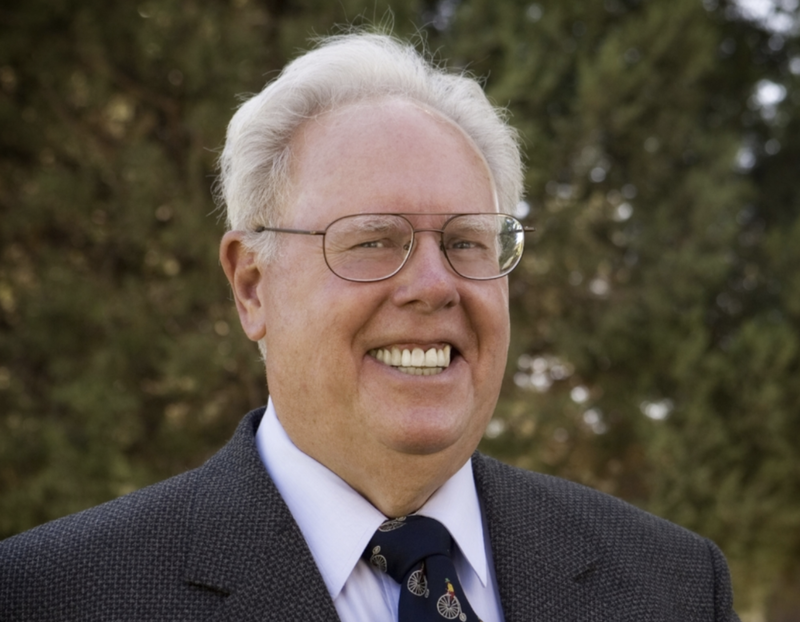 During my bicycle industry career in the 1960s & 1970s I wore a tie almost every day." "I was on the set/location once or twice during the filming of the movie. On one occasion, my youngest son, Randy Cohen, age 13, was also on location with my aunt Shirley Parrish there to be his guardian. Someone from the Studio asked my aunt if she would please drive my car during one of the scenes with Randy sitting as shotgun. She agreed; so both of them & my car are in one of the scenes for a split second." "This is where I do my work (play) every day. The decor is all bicycle stuff as is the decor in the rest of our home. If you phone me I will point out some E.T. stuff which is included in the decor. There is also a large (huge) original painting of Marilyn Monroe posing as Lillian Russell with a gold bike (the original photo was taken by Richard Avedon)." 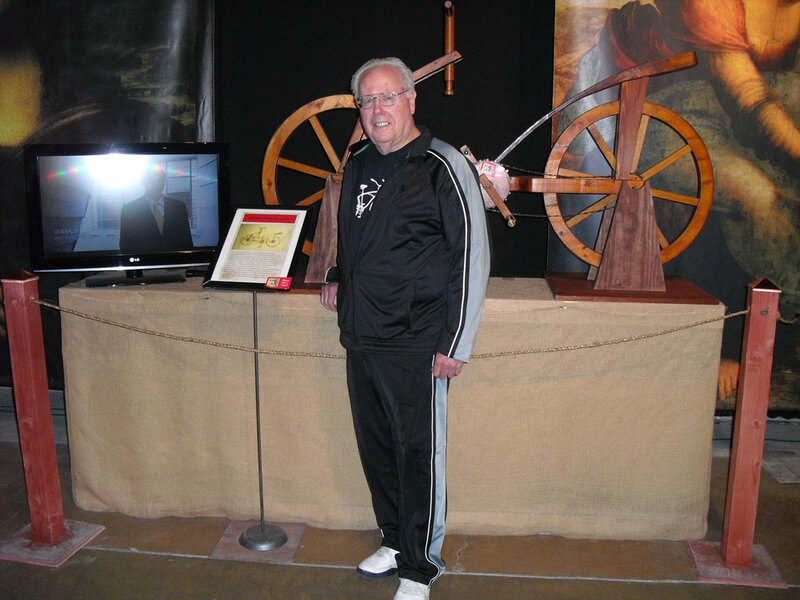 "Here is a pic of me taken earlier this year  when I spend half of a day viewing the Leonardo da Vinci Exhibit which was shown in Denver for several weeks. I played tennis in the morning before going to the exhibit. You probably can't notice the old bicycle on my t-shirt."